Background Indwelling urinary catheters are commonly used for patients undergoing general and orthopaedic surgery. Despite infectious and non-infectious harms of urinary catheters, there is limited guidance available to surgery teams regarding appropriate perioperative catheter use. Objective Using the RAND Corporation/University of California Los Angeles (RAND/UCLA) Appropriateness Method, we assessed the appropriateness of indwelling urinary catheter placement and different timings of catheter removal for routine general and orthopaedic surgery procedures. Methods Two multidisciplinary panels consisting of 13 and 11 members (physicians and nurses) for general and orthopaedic surgery, respectively, reviewed the available literature regarding the impact of different perioperative catheter use strategies. 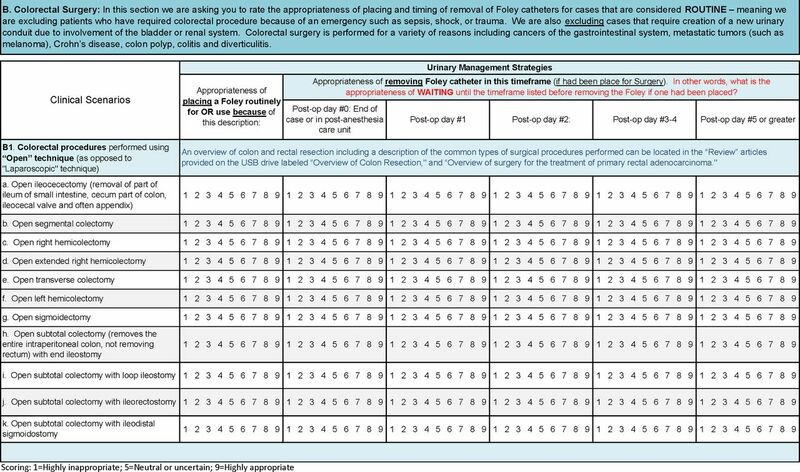 Using a standardised, multiround rating process, the panels independently rated clinical scenarios (91 general surgery, 36 orthopaedic surgery) for urinary catheter placement and postoperative duration of use as appropriate (ie, benefits outweigh risks), inappropriate or of uncertain appropriateness. Results Appropriateness of catheter use varied by procedure, accounting for procedure-specific risks as well as expected procedure time and intravenous fluids. Procedural appropriateness ratings for catheters were summarised for clinical use into three groups: (1) can perform surgery without catheter; (2) use intraoperatively only, ideally remove before leaving the operating room; and (3) use intraoperatively and keep catheter until postoperative days 1–4. Specific recommendations were provided by procedure, with postoperative day 1 being appropriate for catheter removal for first voiding trial for many procedures. Conclusion We defined the appropriateness of indwelling urinary catheter use during and after common general and orthopaedic surgical procedures. These ratings may help reduce catheter-associated complications for patients undergoing these procedures. Infectious and non-infectious urinary catheter complications. CAUTI, catheter-associated urinary tract infection. Perioperative urinary catheter use has previously been considered routine, but more recent guidelines recommend using urinary catheters only when required and removing them as soon as possible postoperatively.10–18 Some procedure-specific literature reviews and protocols promoting enhanced recovery after surgery provide guidance on when a urinary catheter can be avoided or removed after brief use.10–18 More recently, institutions are developing guidelines for urinary catheter use based on consensus agreement among an institution’s own surgeons,19 20 which can vary by procedure types and case complexity seen at each institution. The currently available guidelines are not defined enough to be both broadly applicable to a large variety of surgical procedures, as well as to account for procedural complexities that only some surgeons and institutions encounter (eg, complex colon surgery). To address this gap, we applied the RAND Corporation/University of California Los Angeles (RAND/UCLA) Appropriateness Method 21 to formally rate the appropriateness of urinary catheter placement and timing for removal across routine general and orthopaedic surgical procedures in adults, as rated by clinicians who practise in different clinical settings across the USA and informed by the available literature involving perioperative urinary catheter use. We sought to provide guidance for and promote standardisation of urinary catheter use during and after these common procedures in order to appropriately minimise catheter use and related complications, and to be applicable across many institutions — yielding the Michigan Appropriate Perioperative (MAP) criteria for urinary catheter use in common general and orthopaedic surgeries. For each panel, we performed a systematic literature search in Web of Science, Cumulative Index to Nursing and Allied Health Literature, Embase, Cochrane and PubMed/MEDLINE. Searches identified studies involving procedures of interest with respect to urinary catheter use and related outcomes (eg, urinary retention, need for recatheterisation, haematuria, length of stay). Search details are provided in online supplementary appendix figures 1–2 and online supplementary appendix text 1–2. We chose common procedures for general surgery (hernia repair, bariatric procedures, appendectomy, cholecystectomy and colorectal surgery) and orthopaedic surgery (hip fracture repair, elective hip arthroplasty and elective knee arthroplasty). Our final literature searches for the general and orthopaedic surgery procedures were conducted in February and March of 2015, respectively. An expert in urinary catheter use who cares for hospitalised adults reviewed the records meeting the criteria by title, abstract and full-text review to select the final articles. For each search, we categorised articles into groups based on relevance to perioperative catheter strategies and outcomes. The most relevant articles (group 1) reported at least one infectious or non-infectious outcome of interest for procedures with respect to specific urinary catheter strategies. We also identified key review articles that assessed perioperative catheter use for the procedures of interest. Group 2 articles reported relevant patient outcomes without assessing a particular type of urinary catheter strategy, such as urinary retention rates after cholecystectomy. For the orthopaedic search, we also included studies involving bladder scanner protocols in orthopaedic populations (group 3). We prepared summary tables of the group 1–3 articles, organised by procedure type, study design and type of catheter (eg, indwelling catheter, intermittent straight catheter), to provide panellists with infectious and/or non-infectious outcomes reported. For each panel (general surgery, orthopaedics) we recruited experienced, practising experts from academic, private and government organisations from across the USA to participate by sending an introductory email describing the panel and processes. Panellists included surgeons who performed the procedure of interest, perioperative nurses, a urologist and a hospitalist experienced in comanagement of these surgical patients (tables 1–2). In Spring 2015, panellists were mailed materials that included instructions, printed literature summary tables, articles in electronic form on flash drive, printed key review articles assessing surgical outcomes with respect to urinary catheter strategies, and a round 1 scoring document (example section in figure 2). We included clinical scenarios for panellists to rate the appropriateness of catheter placement (on a scale of 1–9) for intraoperative use and when the first voiding trial should occur after a given surgery. Catheter placement and the timing of removal were considered appropriate if ‘The expected health benefit (eg, relief of pain, reduction in anxiety, improved functional capacity) exceeds the expected negative consequences (eg, mortality, morbidity, anxiety, pain, time lost from work) by a sufficiently wide margin that the procedure is worth doing, exclusive of cost’.23 24 A rating of 1 indicated the harms significantly outweigh the benefits (ie, inappropriate), whereas a rating of 9 indicated the benefits significantly outweigh the harms (ie, appropriate). A central rating of 5 indicated the benefits or harms were considered equal by the participant, or that the participant was unable to make an informed rating of the clinical scenario. Example of clinical scenarios from the round 1 rating document. The scenarios focused on adult patients undergoing routine surgery in acute care inpatient or outpatient settings. We instructed panellists to use their best clinical judgement in combination with evidence from the literature review, assuming no other relevant patient characteristics or clinical indications for a urinary catheter than provided in the scenario. Panellists were instructed to focus on the appropriateness of catheter use with respect to the surgery performed, but without respect to catheter use specifically due to anaesthesia options of spinal or epidural anaesthesia. After the round 1 ratings were completed, we conducted a 1-hour conference call with the panellists to clarify the clinical scenarios, aiming to reduce disagreement or uncertainty in ratings. The expert panel was then brought together for a face-to-face round 2 meeting, where preliminary scores and rating differences were discussed for each clinical scenario. These meetings occurred in April 2015 (general surgery) and May 2015 (orthopaedics). Panellists rerated each clinical scenario after the inperson discussion. The median round 2 scores were used to classify each scenario as appropriate (panel median score of 7–9); uncertain or neutral (panel median score of 4–6); or inappropriate (panel median score of 1–3) if there was no disagreement among the panel. If four or more panellists rated a scenario as appropriate (score of 7–9) and four or more rated it as inappropriate (score of 1–3), the scenario was rated as uncertain or neutral due to disagreement. Clinical scenario ratings from each panel were reviewed, and converted into a single, one-page, clinician-friendly table of recommendations to consider implementing to reduce catheter use. Of note, the RAND/UCLA Appropriateness Method is designed to rate the appropriateness of a therapy (in this case, perioperative urinary catheter use) with respect to specific clinical settings. We applied this method to rate the appropriateness of placing a urinary catheter for use during the surgery, as well as the appropriateness of different timings for removal of the urinary catheter for the first voiding attempt. This method deliberately does not require consensus, because it recognises and allows for differences in clinical practice for which variation is acceptable, particularly when the medical literature does not clearly demonstrate one superior strategy of care. Therefore, for some procedures, the recommendations that are provided yield a single recommendation for catheter avoidance or use. However, in other procedures, more than one strategy of care was assessed as appropriate. For example, it may be appropriate to remove a catheter for a specific procedure either on the day of surgery or on the morning after surgery. Thus, this method yields both recommendations for the soonest a catheter could be removed for the first trial of urination without a catheter, as well as guidance for when two strategies of catheter removal are both appropriate, which allows the catheter use criteria to be applied to medical charts to assess appropriate use. Forty-five group 1 studies25–68 (online supplementary appendix table 1) including 18 randomised controlled trials (RCTs) and 1 systematic review13 involving catheter use in colorectal surgery were identified. The procedures studied included colorectal surgery,34–57 bariatric procedures,25–27 cholecystectomy,28–33 herniorrhaphy58–66 and other abdominal surgery types.56 67 68 Surgical approaches included laparoscopic and open procedures of varying levels of complexity, surgery for malignant and benign diagnoses, ‘fast track’ or enhanced recovery after surgery protocols, and surgeries with varied anaesthesia type. Many group 1 studies (online supplementary appendix table 1) using protocols with catheter avoidance or early postoperative catheter removal studies reported equivalent or fewer episodes of retention, recatheterisation or infection; however, several cohort studies reporting catheter use rates did not include a control group. The final detailed ratings of urinary catheter appropriateness for each of the 91 general surgery clinical scenarios for routine procedures are provided in online supplementary appendix table 2. Table 3 provides the overall summary of perioperative urinary catheter use recommendations, categorising the procedures into three categories: (A) procedures for which indwelling urinary catheter placement should be avoided, (B) procedures to consider removing indwelling urinary catheters before leaving the operating room (OR), and (C) procedures in which urinary catheter use in the OR and until at least postoperative day 1 is appropriate, with guidance on when the first trial of void is appropriate. For a few procedures, as explained above in the Methods section, the RAND/UCLA Appropriateness Method assessed two different timings of the first trial of void as appropriate, such as removal at the end of the case or on postoperative day 1. In these cases, the procedures are listed in table 3 in the earliest trial of void timing (category A, B or C) that was deemed appropriate, with a footnote indicating when later first trials of void were also felt to be appropriate. There was less confidence in removing catheters on postoperative day 0 for some procedures if no postoperative bladder scanner was available as reflected in several median scores compared with appropriate ratings with available bladder scanner. By discussion it was clear that bladder scanner availability and use were now common; table 3 reflects the panel’s recommendations assuming a bladder scanner is available to use in the postoperative setting. Routine catheter placement was rated inappropriate for laparoscopic cholecystectomy, open appendectomy, laparoscopic appendectomy without a suprapubic port, open repair of reducible hernias (inguinal, femoral, umbilical, epigastric), and most laparoscopic repairs of reducible hernias of the same types if the patient voided preoperatively. One exception was laparoscopic reducible inguinal or femoral hernia repair by a totally extraperitoneal approach, for which there was some uncertainty on appropriateness of not using a catheter if the patient voided preoperatively; however, there was agreement on routine catheter placement for use in the OR as appropriate if the patient had not voided, with the recommendation to remove after the procedure, ideally before leaving the OR. Four laparoscopic bariatric procedures (Roux-en-Y gastric bypass, adjustable gastric banding, sleeve gastrectomy, biliopancreatic diversion with duodenal switch) were discussed as sufficiently common to permit the rating of urinary catheter appropriateness. Routine urinary catheter use in the OR was inappropriate for adjustable gastric banding, of uncertain appropriateness for sleeve gastrectomy, appropriate for Roux-en-Y gastric bypass, and appropriate for biliopancreatic diversion with duodenal switch. For all four procedures, waiting until postoperative day 2 to remove the catheter for the first voiding trial if a catheter had been placed was inappropriate. Catheter placement in the OR was rated highly appropriate for all routine colorectal procedures queried. For higher colorectal resections (ie, open or laparoscopic ileocecectomy, hemicolectomy, transverse colectomy, or sigmoidectomy), the time of catheter removal for the first voiding trial using a postoperative bladder scan protocol was rated as appropriate as early as postoperative day 0 (such as at the end of the case in the OR) or postoperative day 1, with waiting until postoperative day 2 or later rated as inappropriate. As summarised in table 3 and detailed in online supplementary appendix table 2, there was substantial variation in opinion regarding timing of catheter removal for some of the more complex lower colorectal procedures (eg, laparoscopic abdominal perineal resection), yet high agreement catheters should be removed for all of these procedures for the first trial of void by postoperative day 4. For one procedure, total proctocolectomy, the panellists agreed that removal for the first trial of void by postoperative day 4 was appropriate, but could not agree on a particular day within the range of postoperative days 1–4 as being more appropriate than others. Panellists were also asked if a suprapubic port in laparoscopic surgery impacted the appropriateness of perioperative urinary drainage strategies. Panellists indicated it was appropriate to have the patient void preoperatively with the option of bladder scanning without placing an indwelling urinary catheter routinely, but were undecided about the appropriateness of routine indwelling urinary catheter placement in this setting. Discussion revealed this practice was highly influenced by how the surgeon trained and if the surgeon had experienced any bladder complications with suprapubic port procedures. Twenty group 1 studies68–87 (online supplementary appendix table 3) including eight RCTs and one narrative review88 involving catheter use in joint replacement were identified. Most articles include both total hip and knee arthroplasty procedures, including both hip fracture and elective hip arthroplasty. Catheter strategies studied included performing surgery without indwelling catheters, removing catheters in the OR, removing early on postoperative day 1 or removal within 48 hours, with several studies involving spinal anaesthesia protocols. Many, but not all, studies demonstrated that avoiding or reducing catheter use was not associated with higher rates of adverse outcomes, including three studies69 75 79 supporting the avoidance of routine indwelling catheter use in patients receiving low-dose spinal analgesia. The final detailed ratings of urinary catheter appropriateness for each of the 36 orthopaedic surgery clinical scenarios are provided in online supplementary appendix table 4. Table 3 provides the overall summary of the perioperative urinary catheter use recommendations, categorising these routine hip and knee procedures into the same three categories used to categorise the general surgery procedures, as described above. In general, many common hip and knee procedures were assessed as appropriate to be performed without catheters, with other longer procedures appropriate to have a catheter placed but removed shortly after the surgery (such as before leaving the OR) or on postoperative day 1. Waiting until postoperative day 2 or later was assessed as inappropriate for routine knee or hip arthroplasty procedures, including repair of hip fracture. For knee arthroplasty including unilateral, total or unicompartmental, or revision ≤2 hours, avoiding routine indwelling urinary catheter placement was recommended given it was appropriate to simply empty the bladder preoperatively by voiding or bladder scan with one intermittent straight catheterisation. Routine catheter placement was of uncertain appropriateness for bilateral total knee arthroplasty, meaning it could be used at the surgeon’s discretion. If placed, removal was appropriate on either the day of surgery or postoperative day 1. For elective unilateral prosthetic hip replacement without hip fracture, routine indwelling urinary catheter use is not recommended. However, routine catheter use was recommended for bilateral or revision hip arthroplasty with expected duration of >2 hours. Panellists were undecided regarding routine catheter placement for revisions lasting 2 hours or less. If a catheter was placed for any of these hip procedures, removal was recommended on postoperative day 0 or 1, as detailed in table 3. To begin the discussion of catheter use in patients with hip fracture, we first queried the appropriateness of placing an indwelling urinary catheter at the time of presentation to the emergency department in patients with hip fracture with uncontrolled pain. Indwelling urinary catheter placement was rated as inappropriate for male patients given the option of external ‘condom’ urinary catheters, and was ‘uncertain’ by neutral scores for female patients, though this is in the context of most clinicians not yet experienced with the more recently developed female external catheters to collect urine in women who cannot be easily turned. Voicing concern for prosthetic joint infection from urinary catheter-associated bacteriuria or infection, the orthopaedic panel also rated the use of indwelling urinary catheters as inappropriate in the postoperative hip surgery patient with incontinence, regardless of whether the wound was draining or not, either before or after removal of the occlusive dressing. For unilateral closed reduction percutaneous pinning for femoral neck fracture, the panel ratings indicated that routine indwelling urinary catheter placement for OR use could be avoided, as having the patient void preoperatively or use of bladder scanner and a straight catheter to empy the bladder was appropriate. For other types of hip fracture repairs (open reduction and internal fixation, partial or total prosthetic hip arthroplasty), the panellists were uncertain about appropriateness for routine initial placement for OR use; if placed, catheter removal was appropriate on postoperative day 0 or 1. We used the RAND/UCLA Appropriateness Method which combines a detailed review of the literature as well as multidisciplinary clinical expertise to inform a formal multiround rating method to determine appropriateness of placing indwelling urinary catheters for use in the OR for common general surgery and orthopaedic procedures, as well as appropriateness of the postoperative timing of urinary catheter removal, producing the Michigan Appropriate Perioperative (MAP) criteria for urinary catheter use. Although we anticipate that several of the general surgical procedures, particularly when performed in the ambulatory setting, are becoming more commonly performed without urinary catheters, we expect that the panel’s recommendations to avoid catheter use in other common procedures such as several laparoscopic procedures (eg, bariatric, cholecystectomy, appendectomy) have the potential to change care for many patients as there remains tremendous variation in practice between surgeons. We also believe that the panel’s agreement that first voiding trials are appropriate on postoperative day 1, for even many complex colorectal procedures (eg, laparoscopic low anterior resection), and that it was inappropriate to wait more than 4 days postoperatively for a first voiding trial, will lead to more standardisation of early voiding trials for patients receiving these procedures, leading to fewer catheter-associated complications. The literature and clinical experts were clear that the risk of infection from the urinary catheter needs to be taken very seriously for orthopaedic procedures, given the high morbidity of prosthetic joint infection. We anticipate the recommendations for reducing urinary catheter use in patients with hip fractures may change practice for many patients, both on surgical and medical services. Our study has several limitations. Though our panels were diverse with broad representation from across the USA—and with significant clinical experience in the procedures evaluated—not every panellist performed every procedure type (or in the case of nurses, cared for every postoperative surgery patient type) that was described in the clinical scenarios for each panel. However, there was significant discussion at the inperson round 2 meeting to allow panellists to query each other’s expertise to inform their own rating of the clinical scenario, as well as the option of rating the catheter appropriateness as uncertain if outside their area of expertise. Limitations notwithstanding, we believe these MAP criteria for urinary catheter use will inform expectations and interventions at the service/unit level, as well as large-scale interventions to avoid placement and support prompt removal of urinary catheters in surgical patients. In combination with the Ann Arbor Criteria for Appropriate Urinary Catheter Use in Hospitalised Medical Patients,22 these perioperative criteria are anticipated to improve the confidence of clinicians to know when catheters can be safely avoided for routine surgical procedures. The authors thank Helen McGuirk for her assistance with coordination of the panels, and all of the panellists who participated in this project.
. The RAND/UCLA appropriateness method user’s manual. Santa Monica, CA: RAND, 2001.
. Outcome evaluation of 10,317 laparoscopic cholecystectomies: a 17-year experience at a single center. Hepatogastroenterology 2013;60:1873–6.
. Fast-track protocol in laparoscopic colorectal surgery: preliminary experience of a pilot study. Surg Endosc 2012;26:S29.
. Clinical benefit of fast-track protocol in frail elderly patients with colorectal cancer. Surg Endosc 2011;13:58.
. An early prediction model for deviation and failure of enhanced recovery after surgery (ERAS) following laparoscopic colorectal surgery. Surg Endosc 2013;27:S98.
. Comparison of early mobilization and diet rehabilitation program with conventional care after laparoscopic low anterior resection: A prospective randomized controlled trial. Surg Endosc 2012;26:S190.
. Laparoscopy and nullfast tracknull rehabilitation in colorectal surgery - Does it improve the patients' outcome (our initial results). Tech Coloproctol 2010;14:91.
. Laparoscopy and ’fast track' rehabilitation in colorectal surgery-does it improve the patients' outcome. Surg Endosc 2012;26:S92.
. Laparoscopy and fast-track rehabilitation in colorectal surgery-does it improve patient outcome. Tech Coloproctol 2011;15:123.
. Enhanced recovery after surgery program for elective abdominal surgery at three Victorian hospitals. Anaesth Intensive Care 2012;40:450–9.
. Endoscopic extraperitoneal herniorrhaphy. A 5-year experience. Surg Endosc 1998;12:1311–3.
. Incidence of and risk factors for post-operative urinary retention in patients undergoing laparoscopic inguinal hernia repair. Colorectal Dis 2014;16:186.
. Voiding in patients managed with or without ultrasound monitoring of bladder volume after outpatient surgery. Anesth Analg 1999;89:90–7.
. Spinal or general anesthesia for inguinal hernia repair?A comparison of certain complications in a controlled series. JAMA 1964;190:25–9.
. Incidence of postoperative urinary retention (POUR) after joint arthroplasty and management using ultrasound-guided bladder catheterization. Minerva Anestesiol 2011;77:1050–7.
. Nurse-generated reminder system to reduce catheter associated urinary tract infection (Doctoral Dissertation): Fairleigh Dickinson University, 2010.
. [Urination problems following total hip arthroplasty: insertion or not of an indwelling catheter?]. Ned Tijdschr Geneeskd 1992;136:827–31.
. Urinary tract catheterization protocols following total joint arthroplasty. Orthopedics 1989;12:1085–7.
. Perioperative urinary catheterisation in conjunction with epidural anaesthesia for hip and knee arthroplasty. Is it safe? Int J Surg Investig 1999;1:157–60. Contributors JM and KEF had full access to all of the data in the study and take responsibility for the integrity of the data and the accuracy of the data analysis. Study concept and design: JM, TAS, KEF, SJB, JD, SS. Acquisition of data: JM, KEF, TAS, SJB, JDM. Analysis and/or interpretation of data: JM, KEF, SJB, JD, SS. Drafting of the manuscript: JM, KEF, JDM. Critical revision of the manuscript for important intellectual content: all authors. Statistical analysis: KEF. Obtaining funding: JM, SS. Study supervision: JM, TAS, SS. Funding This project was funded by a contract from the Agency for Healthcare Research and Quality (AHRQ) (contract HHSA2902010000251/HHSA29032001T). Additional support was received from the University of Michigan and the Department of Veterans Affairs National Center for Patient Safety, Ann Arbor Patient Safety Center of Inquiry. Dr. Meddings' effort on this project was funded by concurrent support from AHRQ (K08 HS19767) and Dr. Skolarus' effort was funded by concurrent support from the Department of Veterans Affairs Health Services Research and Development (CDA 12-171). Disclaimer The findings and conclusions in this report are those of the authors and do not necessarily represent the official position of the Agency for Healthcare Research and Quality, the U.S. Department of Health and Human Services, or the Department of Veterans Affairs. Competing interests JM has reported receiving honoraria for lectures and teaching related to prevention and value-based purchasing policies involving catheter-associated urinary tract infection and hospital-acquired pressure ulcers. SS has reported receiving honoraria for lectures and teaching related to prevention of catheter-associated urinary tract infection, and is on the medical advisory boards of Doximity and Jvion. Data sharing statement All data are included in the online supplementary appendix.